Collaboration between Wendy Leah Dawson and Tim Pugh, commissioned by Blinc Digital Arts Festival. The work documented evolving small scale studio based interventions using a wide variety of timepieces belonging to my father that reflected an ongoing study into the concepts and consequences of passing time. Through visual scenarios and metaphors we attempted to encapsulate the passing of time through observed tracking, rhythmic pulses, measurements, and objects pertaining to the concept of time. 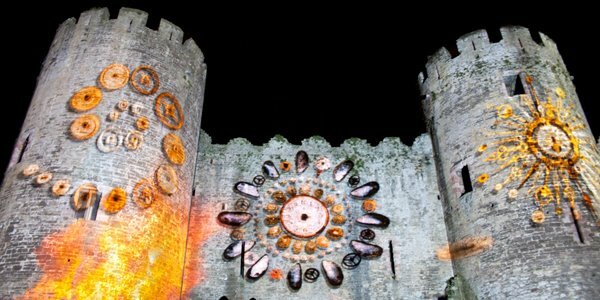 Objects and images moving across the surface of the castle were animated in a lo-fi manner, taking inspiration from a specific point in the town's past when the castle was taken by Owain Glyndwr's supporters and burnt to the ground. The viewer is invited to consider the wider history and context of Conwy Castle and it's location, as well as their own perception of time. With thanks to Roj Smith, David Edwardson and Alan Whitfield for images and film.